- Versatile, affordable, and easy to use and install. - Extremely flexible and durable crystal clear PVC tubing can easily bends into any shape and perfectly fit into any space. - Multi-directional LED bulbs light arrangement provides great lighting coverage area. - Can be cut every 3 foot increments which are conveniently marked at each interval. - Energy-Saving and longer-life: LED lights use minimal power which conserves energy and has a long life span. - High Flexibility, Temperature Sustainability, and UV Resistance: Weatherproof against damaging UV rays and various temperature conditions. Water Resistant (only applies to LED rope portion). LED rope is rated IP65 while the power cord ballast is rated IP44. - Provided connectors allow you to splice and extend LED rope light, or adding other LED ropes in a continuous strand. Instructions included. * Please be aware some water/dust resistant and weatherproofing may be lost when rope light is custom cut and/or spliced. 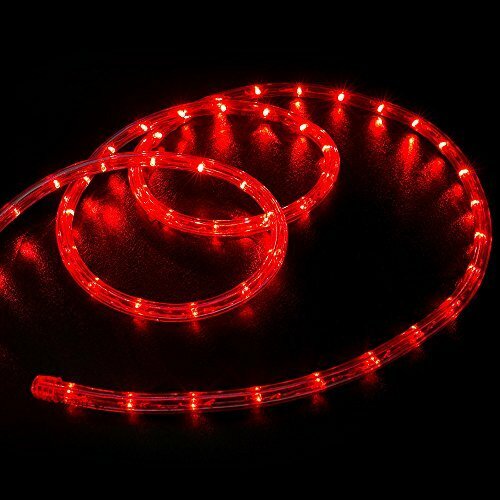 So we strongly recommend using custom cut led rope light mostly indoors. UL & CSA Certified Red LED emits a warm glow and provides high intensity, evenly distributed illumination. Great for accent lighting for any occasion! Cool to the touch when lit, energy efficient and has a long life span. Suitable for both indoor and outdoor use. Highly flexible crystal clear PVC tubing, is easy to bend into any shape and fit any space. Endless applications: buildings, windows, walkway, patios, garden paths, decks, porches, accenting living room, restaurant, clubs, bar and so much more. Able to cut every 3 feet (at marked intervals) for custom fitting and size. Allowing you to get that perfect length. Pre-assembled and workable straight out of the box, allowing for fast and easy installation. Can also be linked together and comes included with power cord, end caps, and splicers along with instructions.